While staying in Cabo recently, I realized that Guacamole had suddenly become such a staple in my diet that I paid little notice to the green dip. This all changed when I had the pleasure to try Guacamole prepared by Chef Larbi Dahrouch, who serves as the Executive Chef for the One&Only Palmilla’s restaurant Agua. The guacamole was just as fantastic as the restaurant and chef. In fact, it was addicting. Chef Dahrouch’s patient demeanor makes him the perfect teacher. 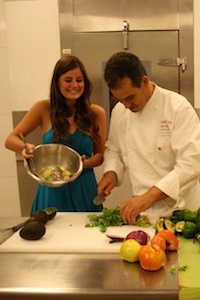 He gives cooking lessons at the Palmilla and says the most requested item is his Guacamole. Mash the avocado pulp, then add the lime juice, cilantro and onion. Add Serrano pepper for spiciness. Mix together and at the end add salt and pepper. Dahrouch’s tip is that the freshest ingredients make the best Guacamole. Make sure that the avocados you use are ripe and soft. If you stick to the basics, you will never need to buy pre-made Guacamole again!